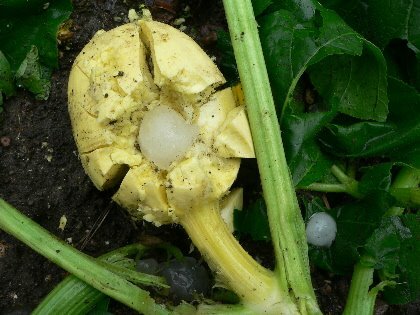 Eyeteeth: Incisive ideas: Monster hail. 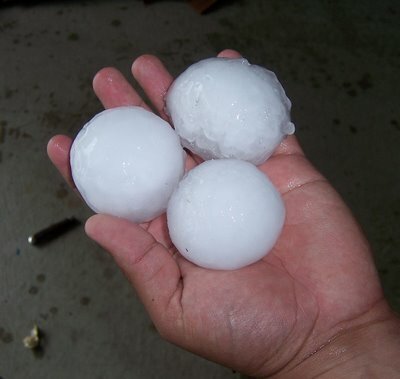 Last night, Northfield (about 40 minutes south of Minneapolis) got hit by a major hailstorm. My brother's Passat was totalled by baseball-sized hail, and many others had damage to windows, trees, cars, and yard furniture. 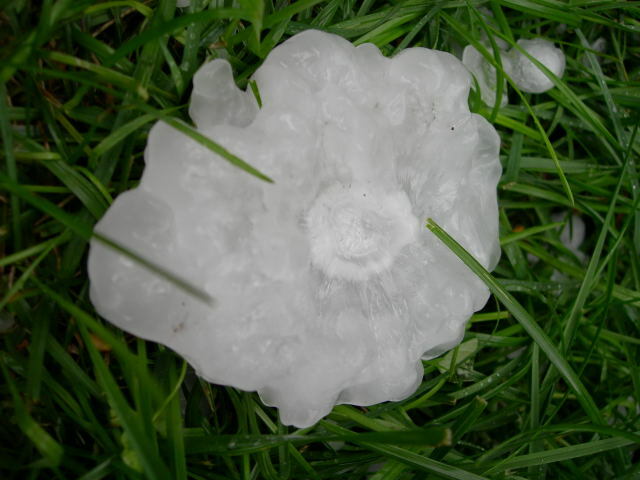 Northfield.org has collected more than 100 photos of the monster iceballs and the destruction. All photos courtesy Northfield Citizens Online/Northfield.org. There is no such thing as global warming. 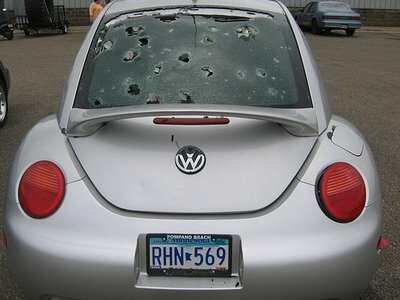 Yeah, riiigght..
Why wasn't anything else damaged on the VW? Just the windshield. and what about the car in the back ground - no damage there either. Welcome Reddit readers (I did notice my site stats jump from 25 an hour to over 300). I just hope you all decide to click my Google ads! Er, thanks for stopping by. Have a look around! P.S. The photo pool of Northfield hail at Flickr is now up to 198 shots. What a crock. We're supposed to believe that hail made those three nice, neat holes in that chair? That must have been some extremely powerful hail! Ha! I was jokin', but I guess I need a disclaimer on such jokes: should you legitimately find yourself interested in the Google ad links at the top of the page, feel free to click them. Legitimately. Olaf grad here. 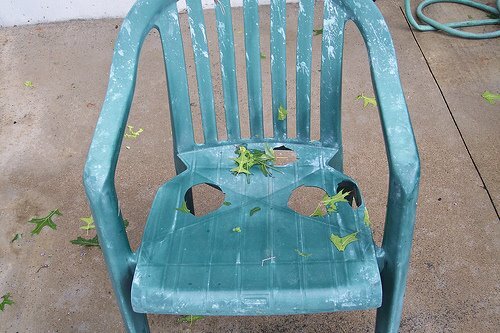 I heard about the hail- pretty crazy stuff. Allright! the same phenomena happened here, in Buenos Aires, Argentina last week. My VWPointer was left like a golf range.. and the plastic chair in my terrace (same model as in your pics)looks exactly the same. 60 % of the cars in this city show the awful effects of the hail (4PM, no warning! )not to talk about the many damaged roofs and the 14 people injuried by the devilish ice balls!! 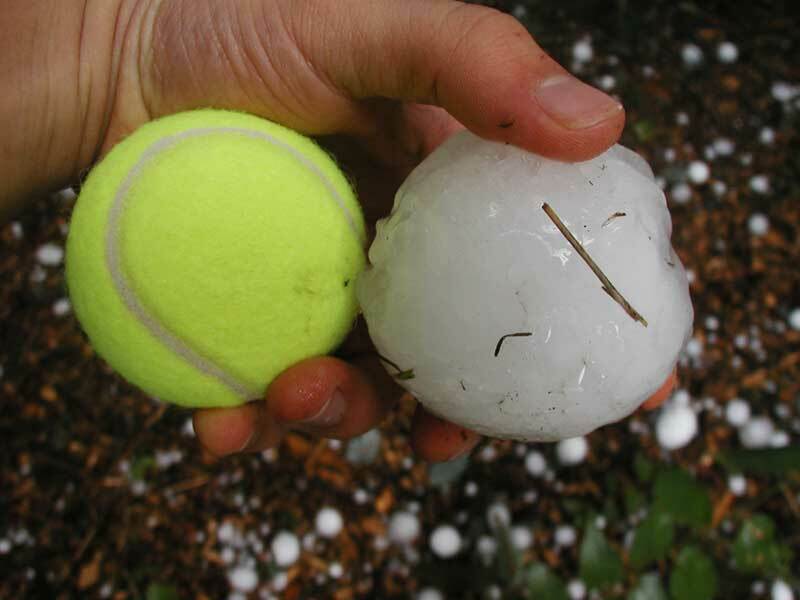 Super-size hail is real and does awesome damage. There was a monster hail storm in Sydney, Australia a few years ago (14 April 1999) that did over a billion dollars in damage... yes, a Billion. Destroyed or damaged appprox 40 thousand cars, and damaged 20 thousand homes. nothing else was really damaged on the car because those are made of almost entirely plastic. i had a newer jetta for a while and ran into so many things and nothing would happen. you can see some dents if you look, though.